Human overpopulation is a serious global phenomenon that is still taking place today. The demographic transition theory explains one of the methods in which overpopulation can slowly decline as a nation develops. The demographic transition theory is a model that tries to explain the stages of population growth for nations over a period of time. For example, before industrialization many nations had significant high death and birth rates; however, this allowed the population to remain stable. For example, before the industrialization of Great Britain, its population had both high death and birth rates. By analyzing this value between death and birth rates and studying the growth of a population, theorists can evaluate how a nation increases in population based on its development. 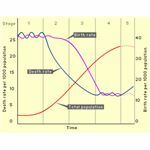 The demographic transition theory is often divided into four stages. However, theorists also speculate that there may be a fifth or sixth stage. This article will concentrate on the four stages. 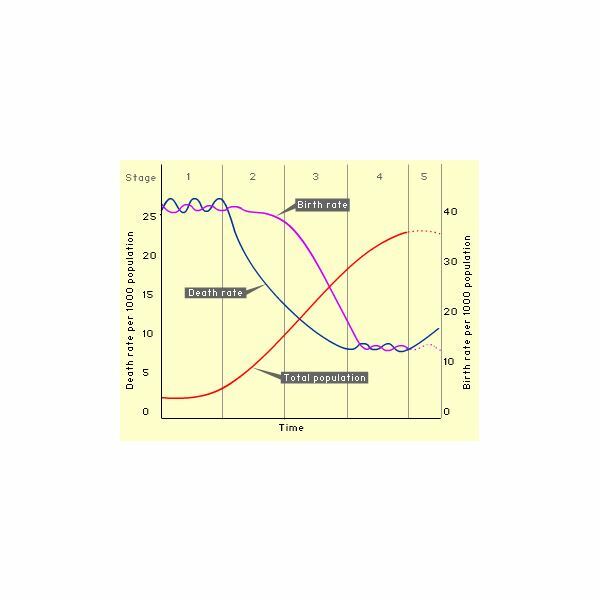 There are roughly four stages of the demographic transition theory. The first stage is before modern industrialization such as the advancement of medicine and the improvement of food distribution. This stage has dominated human history until about the 1800s with high death and birth rates and resulting in a population having a slow population growth. Countries that are before development are included in this category. The second stage is the start of industrialization in a specific nation. For example, the development of modern medicine and food distribution is starting to take hold and the death rate starts to diminish. The birth rate continues to remain relatively high because the society is still adapting to the rise of new technologies. Developing nations would be included in this category and have a significant population boom because of the lower death rates. These nations also produce a difference in a ratio of age groups because the quality of life is better. The third stage is the end of the industrialization and the birth rate starts to decline along with the death rate. This is attributed to the society adopting several new ideals such as the rise of birth control, women's rights, couples having fewer children due to economic conditions, and other factors. In a sense, the birth and death rates reach low rates and allow a more stable population. Developed nations, such as the United States at one time, would fit in this category. The fourth stage is the final stage in the demographic transition theory. At this time, developed countries have birth and death rates that have stabilized and produce a very small rate in population growth. Many developed nations will have societies that have a very high amount of older age groups. The United States today is in this stage with its low death and birth rates and very small population growth. 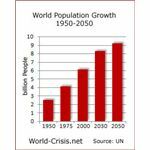 So how does the demographic transition model relate to overpopulation? In a sense, it can depict how developed nations can contribute to a lower emphasis on population growth by adhering to certain principles such as having couples focus on having fewer children. In developed regions where there are significant populations (such as China) it is important to mandate certain ideas (such as contraception) in order to minimize population growth. By having countries follow through these stages, one can understand how overpopulation can be minimized due to the improving health care for birth and death rates as well as certain ideology that couples follow. The demographic transition theory is an excellent benchmark for describing the how populations in societies have changed remarkably. One of the warnings that this theory presents for developed nations in stage four is the risk these countries might face with its low birth and death rates. If countries do not have an increase in birth rates, they may have a negative population growth as a result. For example, if the United States does not have an emphasis on population growth, it may see a drop in its total population due to the current ideology of couples having a minimum amount of children due to their ideology or economic condition. 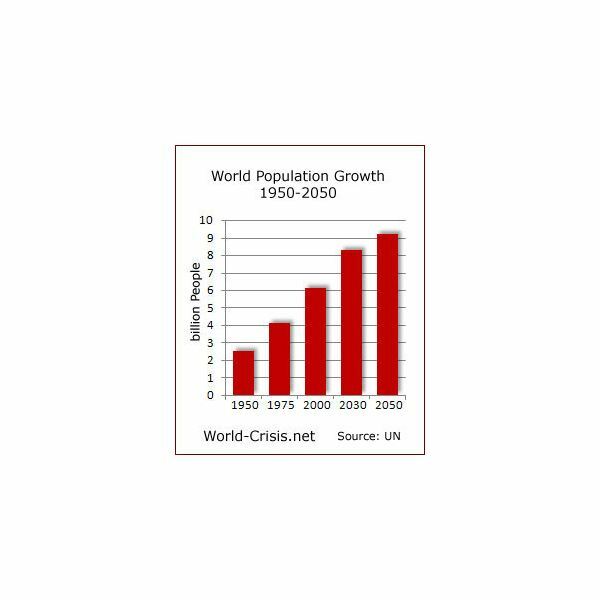 Need information on human overpopulation in the world today? Read Bright Hub's overpopulation series to get a gist of the problems today as well as some theories that help explain this phenomenon.